Add custom branding and navigation to your Lightning app. Make a plan to roll out Lightning apps to your users. Creating and editing a Lightning app is a cinch. As in Salesforce Classic, you can create apps in Lightning Experience, but with even more bells and whistles. 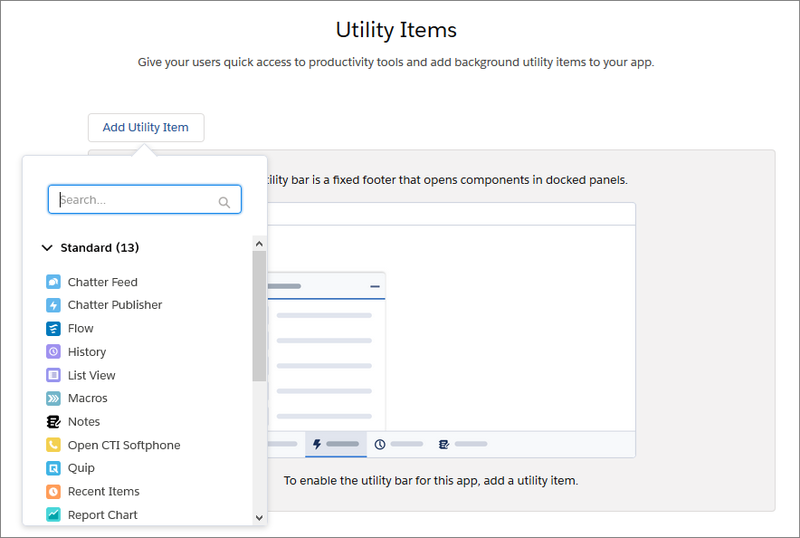 You can brand and customize Lightning apps to help your users work more efficiently. For example, you can create a Lightning app for your finance department that includes all important items (including tabs) that users need to complete common tasks. You can customize the navigation bar color, brand it with a logo, and make the app available in the App Launcher for the user profiles associated with the finance department. If your org includes utilities like Lightning Voice or Open CTI Softphone, you can add them to your app’s utility bar. You’ve got the Warehouse app installed in your org. Let’s create a mini app for the warehouse delivery managers, who want to know what inventory is getting delivered where, whether it got there on time, and what cases related to deliveries are open. In the Lightning App Wizard, create an app with these parameters. Click to open the App Launcher, and select the Delivery Tracker app. It’s got all the custom branding we gave it: a custom icon in the upper left and the custom color we assigned to it. Because Warehouses is first in the navigation bar, it becomes the landing page for the app. And even though App Launcher was an item available for the navigation bar, we didn’t have to add it. It’s there, accessible by clicking . 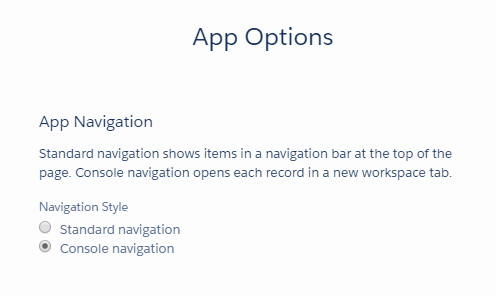 When you create a Lightning app, you get to decide which navigation style is best for your users and what important items belong in the app. So which navigation style is best—standard or console? As with most things, it depends. Service users often work best using console navigation because it shows more information in a single view. Console navigation also provides quick access to standard and custom Lightning components, like integrated telephony, in an optional utility bar. And while console navigation is geared toward service users, other teams like marketing, development, and sales teams can also find it helpful. For example, sales teams can work from phone lead queues or get incoming leads through Omni-Channel, which are utility bar features available only in console navigation. After deciding on the navigation style, your next step is to decide what belongs in the app.